On October 2, 2017 Ambassador Extraordinary and Plenipotentiary of Hungary to Ukraine Ernő Keskeny, Ambassador Extraordinary and Plenipotentiary of the Slovak Republic to Ukraine Juraj Siváček, Ambassador Extraordinary and Plenipotentiary of the Republic of Poland to Ukraine Jan Piekło and Ambassador Extraordinary and Plenipotentiary of the Czech Republic to Ukraine Radek Matula visited the Ivan Franko National University of Lviv. As part of their visit, they had meetings with the Rector, Professor Volodymyr Melnyk, and the students of the University. During the meeting with the ambassadors the Rector of the University Volodymyr Melnyk expressed appreciation for the fact that the Visegrad countries actively cooperate with Ukraine, and the scientific institutions of these countries help to develop educational and scientific initiatives of the Ivan Franko National University of Lviv. “Our University is open to cooperation with the academic institutions of the states that you represent. I am convinced that through joint efforts we will be able to overcome all the difficulties Ukraine has faced on its way to European integration and will deepen our cooperation in all spheres,” said the Rector of the University. The ambassadors of the Visegrad countries expressed their full support for Ukraine in its pursuit of democratization, reforms and European integration. 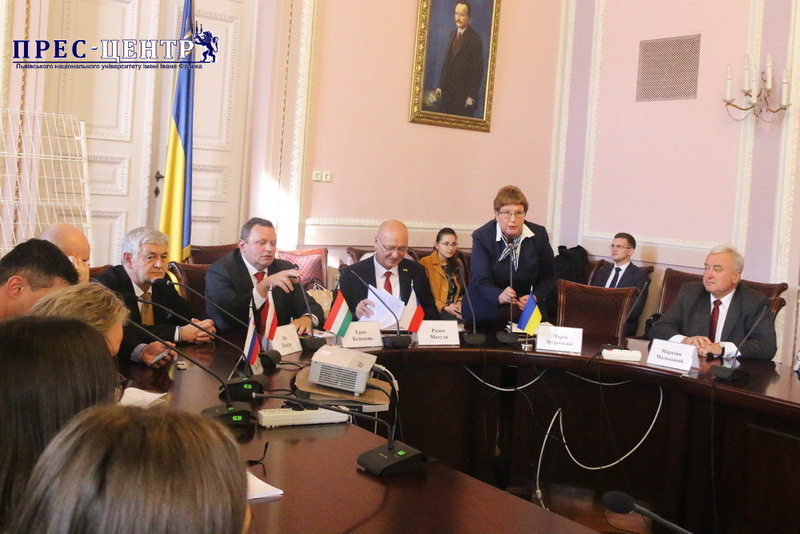 When addressing the students in the Mirror Hall of the University, the diplomats emphasized that Hungary, Poland, the Czech Republic and Slovakia were and would remain reliable friends and partners of Ukraine. Ambassador Extraordinary and Plenipotentiary of Hungary to Ukraine Ernő Keskeny expressed conviction that the role of the Visegrad Four has never been as important as now when entire Europe has faced hard times. “The challenges Europe and the world have met today make us cooperate more closely and seek solutions to all the problems,” said Ernő Keskeny pointing out that the Visegrad format would continue to be relevant to all member states. Ambassador Extraordinary and Plenipotentiary of Poland to Ukraine Jan Piekło expressed his gratitude to the young people for their firm position during the Revolution of Dignity on Independence Square in Kyiv. According to the diplomat, it was then that the Ukrainian society proved that they were ready to follow the path of the reforms and European integration. “Ukraine needs the possibility of full integration into the European Union in the same way as we needed it at the time of our alignment with the EU. The countries of the Visegrad Four fully support Ukraine on its way to European integration,” said Jan Piekło. Ambassador Extraordinary and Plenipotentiary of the Czech Republic to Ukraine Radek Matula assured that Ukraine’s sovereignty, territorial integrity and democracy are extremely important to his country. “We consider Ukraine our strategic partner and all the processes that are taking place in your country are also important to us. You should not abandon your efforts on the way of reforming the country, because although it is difficult, the changes are necessary for you not to lose and fulfil Ukraine’s aspirations for European integration,” pointed out the Czech diplomat. Ambassador Extraordinary and Plenipotentiary of the Slovak Republic to Ukraine Juraj Siváček also expressed support for Ukraine and emphasized the important role of the young people in the development of Ukraine. “We genuinely care for democratic reforms in Ukraine and we want you, the young generation, to create and develop your wonderful and unique country,” said Juraj Siváček. Then the students had the opportunity to communicate in person with the ambassadors and to ask sometimes complicated questions about the current socio-political situation in Europe, political and economic processes in Ukraine and the role of young people in the integration of our state into the Euro-Atlantic structures. Answering the students’ questions, the representatives of the Visegrad countries once again emphasized that it is extremely important for Poland, the Czech Republic, Slovakia and Hungary to see Ukraine as a strong state. However, they are convinced that the development and integration of Ukraine into the EU depends on Ukrainians themselves. In the context of European integration aspirations, Ambassador Extraordinary and Plenipotentiary of Poland to Ukraine Jan Piekło emphasized that the European Union needs Ukraine to successfully develop its structures, while the Ukrainians need the EU for further progress of their country. Particular attention was paid by the participants of the meeting to the implementation of intergovernmental youth initiatives and methods by which students can accelerate the process of reforming Ukraine and bring our state closer to the EU.